The Detroit Water and Sewerage Department (DWSD) has announced that it is hanging water shut-off notices on Detroit residents’ doors this month, re-starting the internationally notorious, criminal program of cutting off the human right to water. 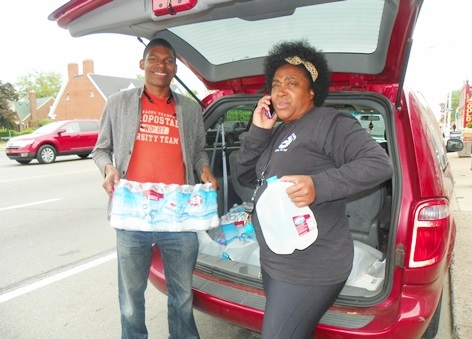 Demeeko Williams and Beulah Walker load water to carry to two Detroit residents, one a senior whose water has been shut off for a year, and another a young woman with a child who has been forced to squat in a Detroit home. Gallons of water are given out freely, with no questions asked. 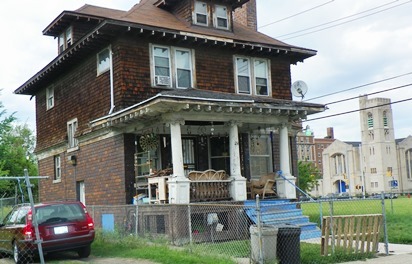 On April 21, VOD interviewed Demeeko Williams and Beulah Walker of the DETROIT WATER BRIGADE, which estimates that 40 percent of Detroit residents and their families may face shut-offs soon. “Last year, Detroit made international headlines when tens of thousands of residents lost their access to water through an aggressive shut-off program by the water department. The city of Detroit has endured decades of economic turmoil, drastic depopulation and repeated mismanagement. The Detroit Water and Sewerage Department (DWSD) is over $5 billion in debt (over $4,500 per family in the metro Detroit area).To compensate, they have increased rates over 119% in the last decade.¹Residents who fall behind on their bills risk water shutoff, and in 2014 that’s exactly what happened to tens of thousands of Detroiters. The shutoff program didn’t work, and the DWSD collected less than 3% of the over $100 million currently owed.² A large number of the families who entered into payment plans last year are now defaulting on them yet again because they lack sufficient income. DWB water hub and HQ. Corruption in the DWSD has been rampant, with former Department head Victor Mercado currently serving an 8-month federal corruption sentence for “conspiracy to commit extortion” by padding department contracts and rigging bids that netted his business associates millions. Although many of those contracts are now being scrutinized by the city’s legal team, Detroiters are still paying dearly for the fraud of past leaders. Nurses help lead last years’ massive march against water shutoffs in downtown Detroit, July 18, 2014. The water department is significantly under-staffed and water infrastructure is crumbling, leading to leaks that cost taxpayers tens of millions annually. The department is unable to address these time-sensitive issues due to lack of funding, as it currently spends 46% of its operating revenue on debt service to banks – the largest line-item by far in its budget. Protesters blockage entrance to city contractor Homrich, which shut water off last year, likely because DWSD workers could not be counted on to do so. The water department acknowledges that 90% of its operating costs are fixed⁷, meaning they don’t depend upon how much water is consumed by users. Still, they charge usage-based rates that fluctuate dramatically with weather (up to 18% decrease in usage) and with broader demographic shifts in the region (2/3 of Detroit’s population has left the city since 1950). 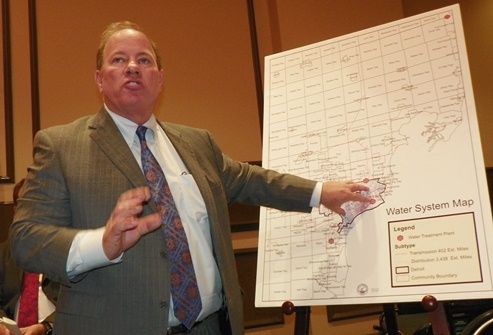 Detroit “Mayor” Duggan shows how only Detroit will remain of six-county area previously run by DWSD Sept. 9, 2014, after Great Lakes Water Authority takes over. Even more drastic rate increases are expected at that time, to pay off $5 billion in DWSD debt. Debt was originally to be cut by $2 billion under bankruptcy plan, but was restored under GLWA plan. Creating a progressive rate structure based at least partially upon a family’s income – as is done with many public services like streetlights, schools, libraries, etc – would more equitably distribute the burden of operating a system relied upon by over 4 million people for essential drinking water. The Detroit Water Brigade has provided emergency relief and advocacy to hundreds of families since June of 2014, including providing immediate financial assistance to families currently without water.⁸We’ve seen first-hand the disastrous effects of these harsh, debt-driven austerity policies. We pledge to escalate this campaign in the coming months until we bring relief to the tens of thousands of metro Detroit families living without water today and the millions living precariously with unaffordable water rates. 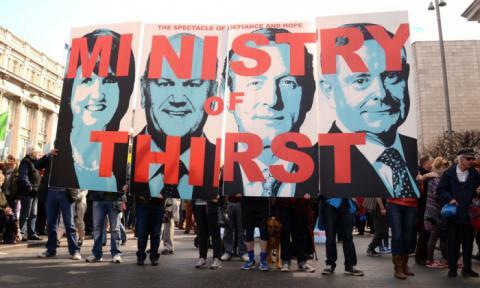 Marchers in Ireland protest government’s austerity measures including water charges. 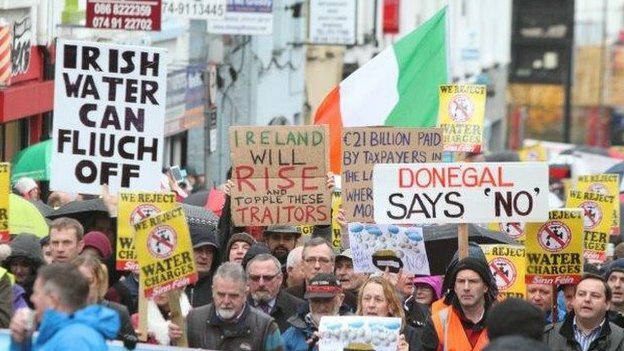 In Ireland, with a population of 5 million, upwards of one hundred thousand took to the streets to protest the new charges for water. The Irish government’s austerity measure has sparked widespread public anger, with Saturday’s street protest the fourth since October. 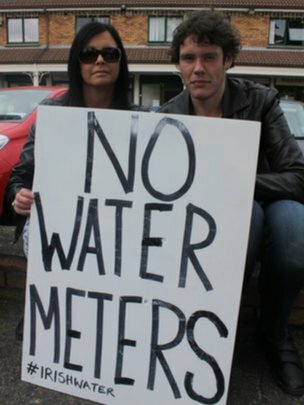 Irish protesters demand that no water meters be installed. One year before it seeks re-election, the government has begun directly charging households for water use. It is the final piece of a seven-year, _30bn (£21.7bn) austerity drive, but also the measure that has elicited the largest public backlash. Saturday’s mass protest was the fourth since October. Irish people demand: Water is a right! 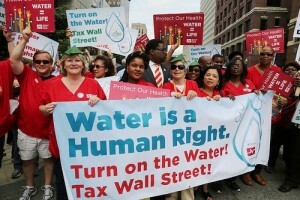 BELOW: DETROIT WATER BRIGADE PARTICIPATES IN DUBLIN MARCH: FROM DUBLIN TO DETROIT, WATER IS A HUMAN RIGHT! This entry was posted in Uncategorized and tagged DETROITWATER. Bookmark the permalink.